Lamborghini Huracan Spyder Review 2019 | What Car? 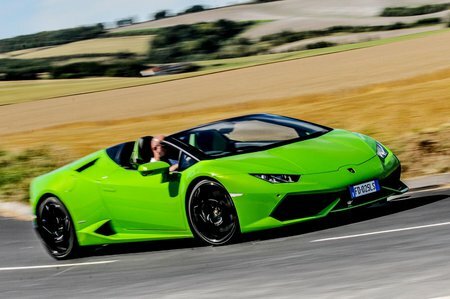 The Lamborghini Huracán Spyder is the end result of removing the roof from a Huracán coupé. It retains the coupé’s angular looks and stonking V10 petrol engine, but replaces its hard top with a fabric roof that folds away in 17 seconds at up to speeds of 31mph. And, like the coupé, the Spyder is available with two or four-wheel drive, but adds 120kg to the coupé’s weight due to the extra strengthening Lamborghini has had to employ to keep its body as stiff as possible. That does little to dumb down the Spyder’s frankly ridiculous performance; its V10 still packs a 602bhp punch (572bhp for the rear-wheel-drive version) that's capable of launching the car from standstill to 62mph in just 3.4sec (3.6sec for the rear-wheel-drive model). If that's not enough, you can blow more cash on the wild Performante version, which has 631bhp and a bunch of active aero aids to make it even faster in a straight line (0-62mph takes just 2.9sec) or round a track. The Huracán Spyder isn’t the only exotic open top on offer to the UK’s richest car buyers. There’s the Ferrari 488 Spider and McLaren 650S Spider, too, while the slightly cheaper Audi R8 Spyder uses exactly the same engine. Read on to find out whether it's worth forking out for this open-top Huracán over the coupé version.